Good morning, dear friends! I hope that your week is off to a great start, and that you are staying warm. Today, I am so excited to share a little space that needed some attention, and the antique Italian Barometer that fit the bill. Just off of the dining room is a hallway that had a little space that needed something. Shortly after we moved in, I placed an antique china cabinet in the spot. However, it just wasn’t what I wanted for the space. I knew that in time, if I was patient, I would find just what I wanted. So for the time being, the china cabinet became a place holder. It has since found the perfect spot in my house, and I will share it later. The other day, I was suffering from cabin fever and decided to visit my local antique market. The first item I stumbled upon was this French chest, and I fell in love with it. It was in excellent condition, and I knew when I saw it that is was just what my little space needed. Now, I just needed the perfect piece of artwork to go over the top of it. Upon further investigation, I stumbled upon this antique Italian barometer. It has long been a dream of mine to own one of these pieces of true art. Mr. Bleu knew this and insisted that I get this to complete my little space. He is the sweetest! Our antique barometer actually works, and we have had more fun watching it predict the weather. Antique barometers have often been used in classical, traditional interiors. These devices have mesmerized designers and collectors for centuries. The barometer was invented in 1643 by a student of Galileo named Evangelista Torricelli. During the 18th and 19th centuries, barometers became very prevalent as symbols of status. Today, these beautiful pieces convey a simpler time when true craftsmanship met a practical function. For now, I have created a vignette using blue and white pieces, an antique candelabra, old books, and flowers. Sweet friends, I am so happy that you stopped by for a visit. Have a wonderful and blessed day!!! Beautiful! Both the wood cabinet and barometer are jewels and that is the perfect spot for them! Thank you, Ana Maria, for your sweet comment! I hope that you had a wonderful weekend, and that you enjoy your week! Gorgeous vignette! That barometer is stunning! Thank you, Zenda! Enjoy your week!!! Oh, Shannon, your vignette is so lovely. You had quite a find in your barometer, it is a beautiful piece. And looks to be in wonderful condition. Don’t you just love wonderful finds? Everything is white here in WV this morning. Stay warm, sweet friend – spring will arrive! Thank you, sweet friend! I hope that you have a happy and blessed week! Just love, love, love the barometer. You could not have made this spot more beautiful! Have a blessed and warm day. Thank you, Bobbie, for your very sweet words! I hope you have a wonderful week!!! What a sweet chest and that barometer is amazing! I always wanted a large French or Italian one. Lucky you! Thank you, Penny! Enjoy your week!!! Shannon, I love the beautiful antiques that you found. The barometer is truly stunning and it is the perfect piece of art over your gorgeous French chest. Your vignette with the blue and white makes everything pop. Lovely as always, dear friend! Thank you, sweet friend! Have a wonderful week!!! Oh Shannon, the antique Italian barometer is beyond fabulous! And the fact that is works is incredible! What a fun piece to have, I’m sure it will be quite the conversation starter! Your vignette is lovely, especially the pop of red on the pretty book stack, and the vibrant fresh feeling the blue and white china adds…I’m sure you smile every time you walk by! Thank you, Jenna, for your sweet words! I hope you enjoyed your weekend! Have a wonderful week!!! Hi, Shannon, I just recently stumbled onto your blog from a Pinterest photo of a room I loved! (Likely because i had been searching French country decor). I decorate in a style very similar to yours (only slightly more casual, I live on a ranch) and it’s so refreshing to find someone who decorates with beautiful antiques and warm rich colors (I love warm yellows/golds, reds, greens, and blues and prefer stained woods over painted pieces)! I also live in Oklahoma, not far from you southwest of Tuttle! Do you mind sharing what store you found that amazing barometer in? I love antiquing! Your home is beautiful!!! Hi Vicki! 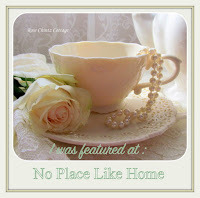 I am so happy that you found my blog and that you share the same decorating style. We lived in Mustang for 10 years and moved to the Tulsa area last year to be closer to family. We are originally from the Wagoner area. I miss Mustang so much! I found my items at The Windsor Market in Tulsa. It is located at the Farm Shopping Center on Sheridan. It is a fun place to shop! In Oklahoma City, I used to love to visit French Quarter Antiques located at May and Britton. They have some beautiful European antiques at great prices. In fact, that is where I found my living room end tables. Thank you so much for your sweet comment, and I am so happy that you stopped by for a visit. Take care, and enjoy your week. Shannon, what finds!!! the chest is amazing and the barometer is the perfect piece to go over it..they compliment each other so well….Glad you had cabin fever! Thank you, Shirley! I hope that you have a wonderful week!!! I love this Shannon! Both pieces look so beautifully at home- they compliment each other so perfectly.